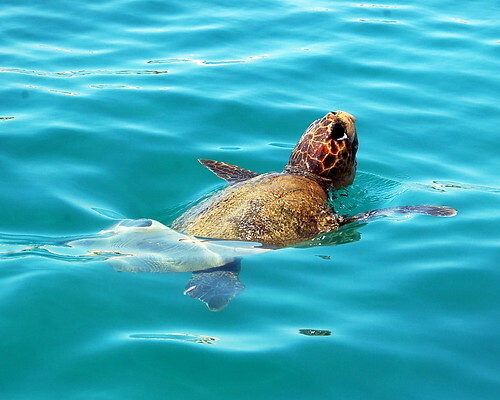 On the Greek Island of Zante (also known as Zakynthos) you’ll find a unique habitat that draws it’s residents back year after year – the nesting beaches of the Caretta Caretta or Loggerhead turtles. If you visit this lovely island which is very popular with British holiday makers you’ll find turtle key rings, turtle soft toys, turtle postcards but will you find the turtles themselves? 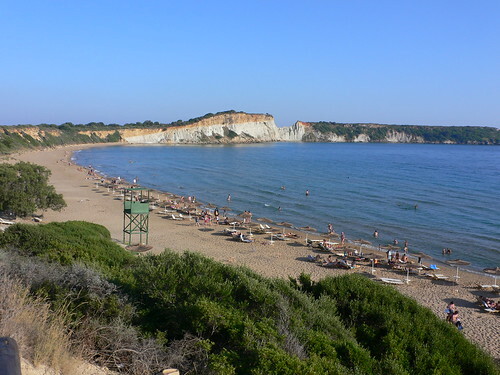 The best place to start your turtles search is at one of my favourite beaches on the island at Gerakas to the south-east corner of the island. The beach is particularly beautiful and unspoilt because it’s protected from development as one of the major nesting sites of the Caretta Caretta turtle, and unlike other resorts, there is no building allowed on the cliffs and land above the beach. Although you can hire a sun-bed and swim from the beach, the turtle nests are marked and protected to keep them from being trampled on. 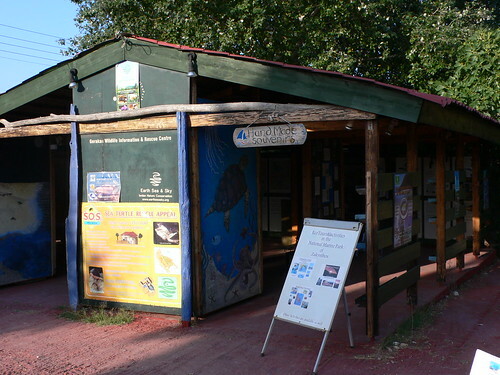 If you’d like to find out more, you can visit the Earth Sea and Sky wildlife information centre close to the car park above the beach which was started by local conservationist Yannis Vardakastanis with the aim of educating visitors and protecting the wildlife of the area from the growing incursions of tourism. Yannis runs a volunteer programme hosting people from all over the world who come to help with habitat preservation and clean-up activities. When I met Yannis last summer, he told me how he grew up swimming and playing on the beach with just the turtles for company, in the days before direct flights started bringing many visitors to the island. As the numbers of tourists grew, he realised that he needed to do something to protect the beach and the turtles’ habitat, so he started working in conservation and has now won several awards for his work. But having found out about the turtles at the information centre, you’ll be left wanting to see one and the best way to do that on a boat trip, many of which are organised from this end of the island. Yannis runs trips around the bay on a catamaran through his Eco-tourism company Nature World Travel in a sensitive way that does not disturb the turtles. You’ll also find many other companies offering trips, especially from the nearby Laganas bay which is just around the headland from Gerakas but much more built up. If you want enjoy seeing the turtles in a way that preserves them for the future, then take a bit of time to check out that you are using a reputable company that respects the laws of the National Marine Park. Within the National Marine Park some areas are out of bounds for boating and watersports, others have restrictions on speed or on dropping anchor and your trip provider should respect these regulations. If a turtle is spotted, the boat should shut off their engine and remain 10 metres from the turtle so as not to distress it. The boat should only stay near the turtle for 5-10 minutes and no swimming with the turtles is allowed. If you see any rubbish floating in the water or on the beach you should pick it up, as many turtles die from eating plastic bags that they mistake for jellyfish. The boats should not discharge their septic tanks into the water which pollutes the sea and the turtle’s habitat. Beware of any operators that guarantee a sighting of the turtles or offer your money back, as this encourages boats to chase the turtles and distress them. Welcome to Heather, our second guest blogger who’ll be helping us out while Sue is on Maternity Leave. Heather Cowper is the author of “Heather on her Travels“, a blog she started to share her passion for her travel experiences with her friends and quickly became as passionate about her travel writing.